Malaysian oil and gas major Petronas Lubricants International (PLI) has launched the Petronas Sprinta F900 with Ultraflex engine oil in the Indian market. Designed for motorcycle engines, the company says that the oil is formulated to resist engine stress and prolong its life. The new engine oil will be available globally in a phased manner, beginning March 30, 2017. Speaking about the new oil, Giuseppe D'Arrigo, managing director and Group Chief Executive Officer of PLI said that motorcycles are a primary mode of transport for many Indians, and most of the commute is under heavy traffic conditions. This causes a lot of mechanical stress on the engine, leading to wear and tear over a period of time. Also, in our country, these engines are continuously operating at high temperatures in peak traffic which reduces engine life. To address this issue, the Petronas Sprinta with Ultraflex has superior oil film strength that enhances oil stability. Petronas claims the Sprinta's oil film strength is 41 per cent higher than the industry benchmark. The advantages are in the increased ability of the engine to endure the effects of load, speed and stress. In addition, the oil also prevents deposits, ensuring the engine does not lose power over a period of time. D'Arrigo added that in light of the exponential growth in the number of two-wheelers around the world, Petronas aims to use technology as its key differentiator to deliver superior products and capture increased market share. 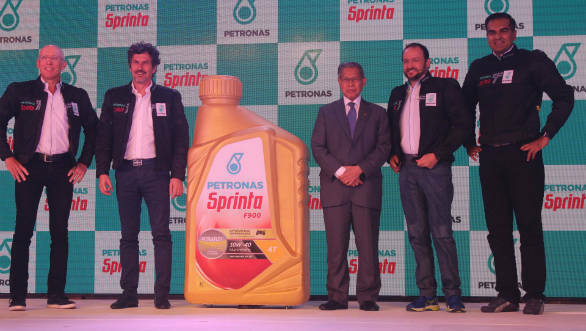 The introduction of the Petronas Sprinta oil in India will boost its aspirations of becoming among the top five lubricant manufacturers in the world.